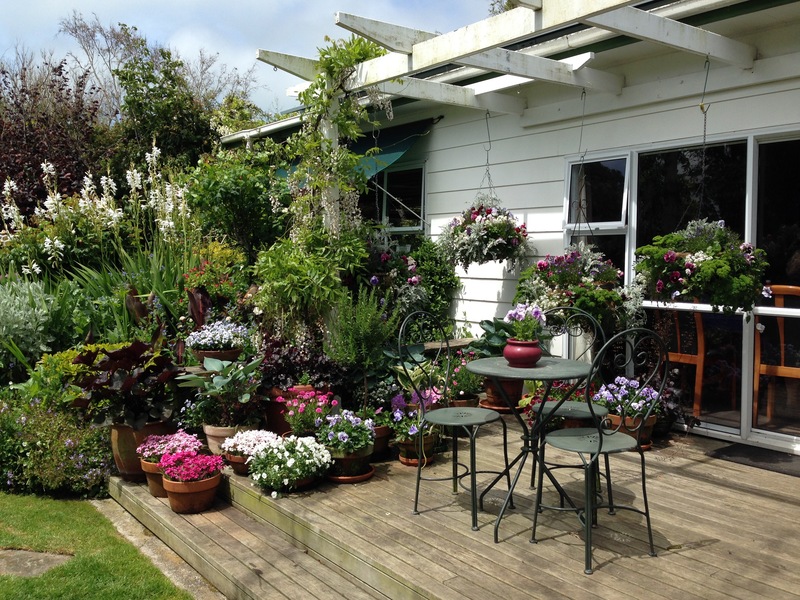 I would describe the Oakley Garden in Manaia as a happy garden. Bursting with colour, it is hard not to have a smile on your face when you are there. 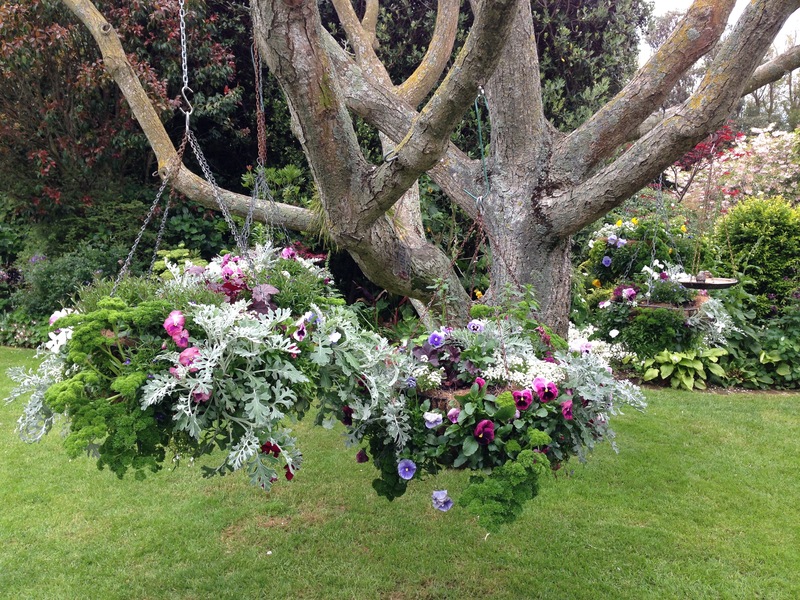 With at least a dozen hanging baskets, and plentiful pots overspilling with annuals, it isn’t a low maintenance garden, but you get the sense that the maintenance is 100% pleasure. I wouldn’t like to have to keep all those hanging baskets and small pots of annuals watered, but how loved does this terraced look? 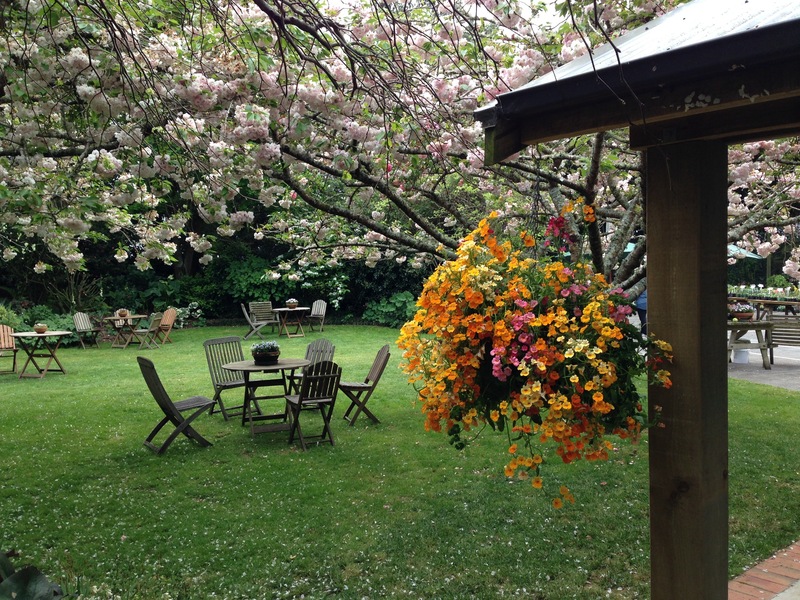 This garden feels loved and cared for by its owners; you can’t imagine that the maintenance consists of a team of landscapers arriving every Wednesday with their mowers and blowers. 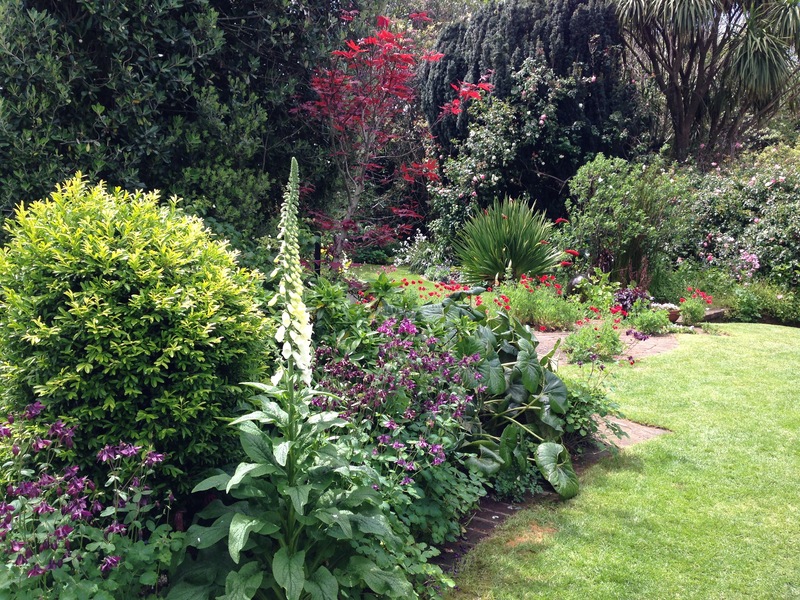 Very clever colour combinations – bold reds and purples with a (presumably) self sown foxglove allowed pride of place – lovely! The delicate pink cherry blossom is in strong contrast to the oranges and yellows of the hanging basket, but doesn’t this look super? 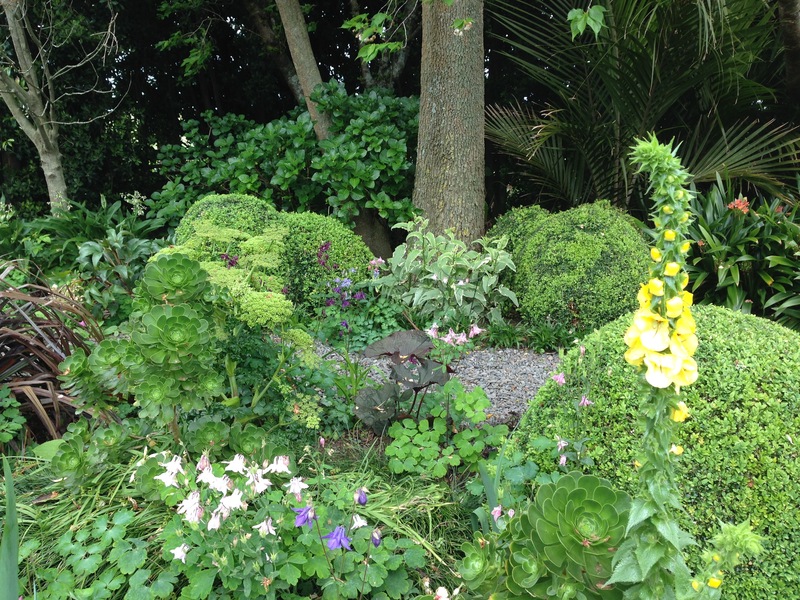 It’s also one of those gardens that looks carefree and yet under the surface real skill has been applied. The colour schemes are subtle; in most areas there are not obvious blue beds and pink beds and so on, but either a lot of thought or an infuriatingly clever, natural skill has reaped rewards in the combining of colours. Perhaps there is an artist in the family? There are also surprising plant combinations to see. A sun loving Aeonium next door to a woodland foxglove? This would normally look all wrong to me, and yet it is carried off here by the sophistication of the overall design. The structure of the pruned Buxus, the contrasting foliage textures, the natural pathway winding its way through…..if you have a lot of the basics right, you can successfully stretch design principles so much further. It is also easier to stretch planting principles further if you have great soil. The Taranaki council describe the region’s landscape as having deep, free-draining, fertile volcanic ash soils. Wouldn’t we all die for these adjectives to apply to our gardens?! 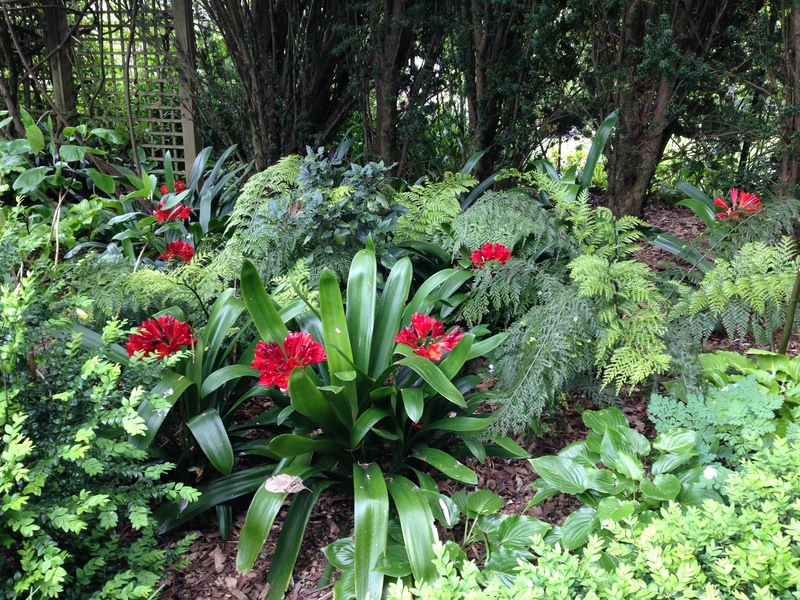 If the soil is ideal, plants will be much more tolerant of other factors, such as shade levels. Most plants will happily be pushed outside their comfort zone in one or two dimensions, but push your luck in more and they will soon tell you, as I am sure we all know! Skillful planting, vibrant colours, extraordinarily healthy plants and a bit of imagination and character add up to a very special garden. It seems to fit perfectly with the house, the surrounding area and its owners, ticking every single box. I love that no one garden is perfect for any two properties, but for this one, it is absolutely spot on! How stunning is the Xeronema callistemon! This looks like a garden lover’s garden. 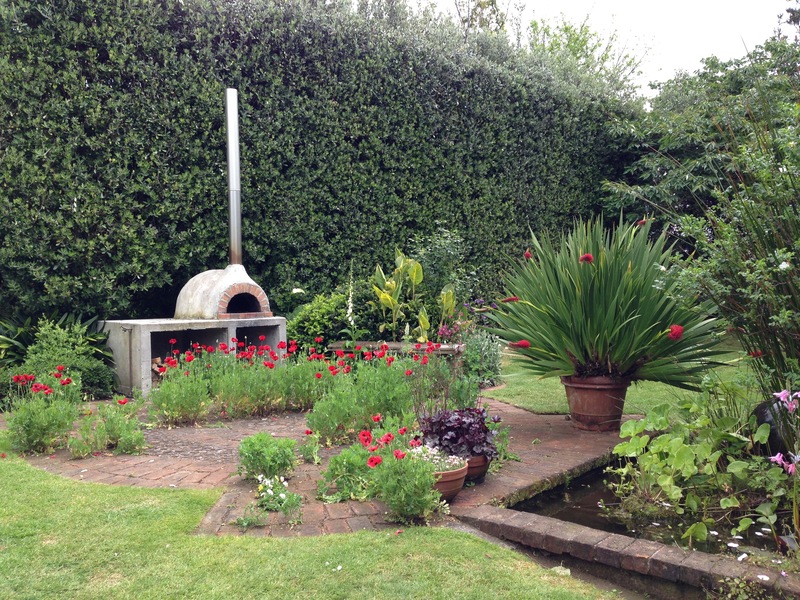 Unlike a lot of the contrived and over-designed gardens you often see now – this garden has soul! Love it Janna. Can’t wait to go and see it later next year hopefully. Yes, you must try and get there, Adriana! It really does have ‘soul’ as its magic ingredient. In the meantime, we need to track down some Xeronema this side of the ditch. I agree, Janna, this is one of those gardens you want to linger in. Such a lovely atmosphere. Also worth noting perhaps that this has been achieved a stone’s throw from the wild Taranaki coast. The garden is surrounded by very high windbreaks and therefore can’t use the outlook over surrounding countryside as we saw at, for instance, Puketarata. I remember standing on the road outside in a howling wind but inside the garden all was peaceful – magic! Thanks for pointing that out, Sarah. Indeed, that wind was quite something. It was so calm in the garden I think I completely blanked it out of my mind! I live in Kent England and I stayed with Jenny & Guy Oakley and had a personal tour of the garden!! 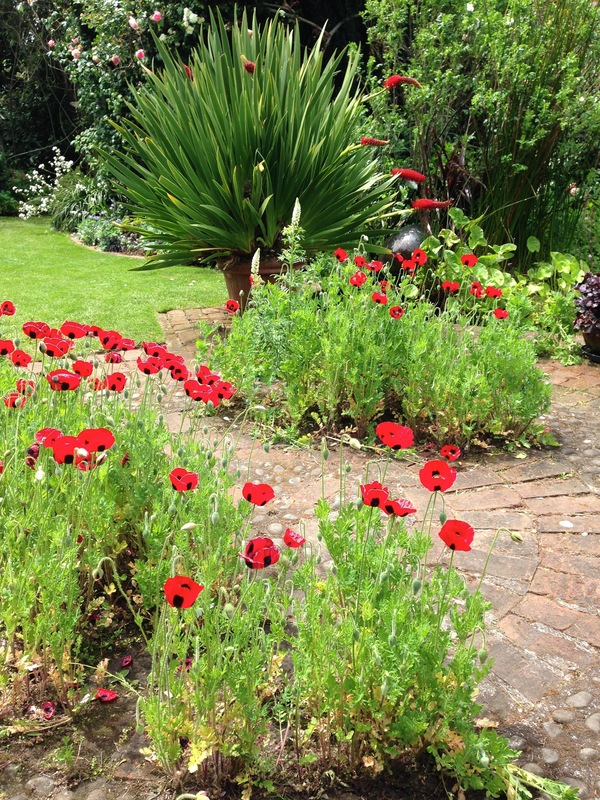 I have had a gardening business here in England so I have seen a few gardens in my time but The Oakley garden made me feel at home and is a true inspiration. Thanks so much for your comment, Lynn. It really is a special garden, isn’t it? I was actually in Kent in October and visited Sissinghurst. A wonderful place too but there is nothing quite like the personal touch, don’t you think? Stop press! I have just received an email from Jenny Oakley letting me know that my ‘shade-loving yellow foxglove’ is actually a Verbascum; Verbascum creticum. It is obvious when you know! 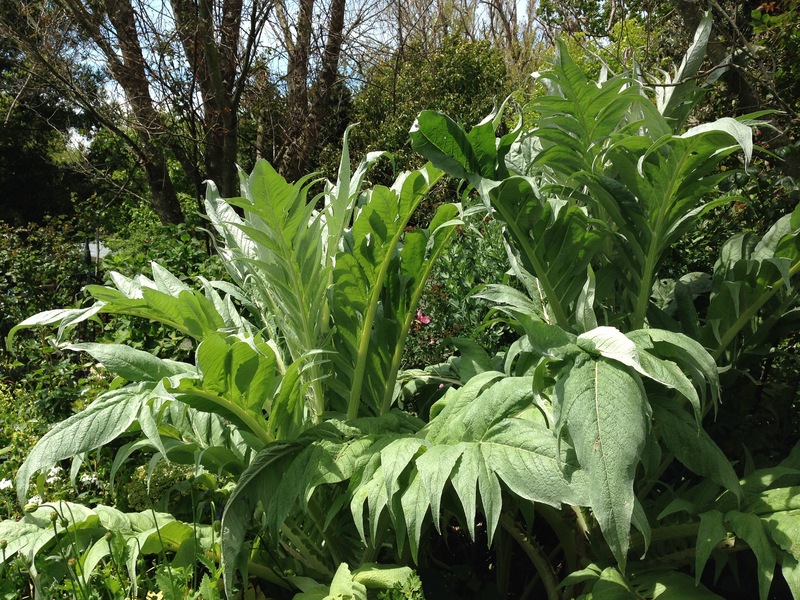 I had been so jealous of all the foxgloves I had seen in Taranaki and with it’s lush green foliage, rather than the more typical grey Verbascum foliage, I jumped to the wrong conclusion. So that photo is of two sun loving plants after all! The good news is, a) I will now know to look more closely and not confuse them in future and b) I may well be able to grow this Verbascum in Sydney and achieve that same ‘vertical spires’ effect. Thanks ever so much, Jenny! Take care Janna – verbascum can be very thuggish in our Australian climate – most species are listed as serious environmental weeds V. creticum is not as bad as V, thapsus but is spreading throughout Vic. parts of SA and in a few areas of WA and Tas. Re the Xeronema you can buy it here from time to time (Garden Express and Benara Nurseries have stocked it- but not at the moment (worth checking from time to time). It is very slow growing (but worth the effort) and not suited to frosty areas (so sheltered position if you have that problem, like I do from time to time).